With Listrak's Modal Lightbox solution, you can control timing, placement and vadence so the lightbox appears when and where you want it, make sure it doesn't appear to customers who have already subscribed, and set a wait period so it only appears to non-subscribers at pre-determined intervals. To reinforce the interaction with the modal Lightbox, Listrak highly recommends following up with a Welcome series campaign to deliver any inventive coupon codes promised at the point of acquisition and to immediately engage new subscribers. We've created the industry's first integrated, actionable Customer LifeCycle Grid, an advanced marketing system, designed to keep customers active and buying. It will increase the engagement levels and Lifetime Values of your customers. Listrak developed one of the first shopping cart abandonment solutions and we remain the industry leader for creative, successful retail remarketing campaigns. The average online conversion rate for retailers is only 3%. Retailers trust us to recover the lost opportunities and revenue. Email remarketing is easy with our single, integrated digital marketing platform. We've helped our retailing clients recover millions of dollars, and we can help you, too. Our Ratings and Reviews Solution automatically incorporates the best reviews into email campaigns, including shopping cart abandonment and product-specific campaigns. While seamlessly integrating with Magento's Rating & Reviews module, this user generated content is proven to influence decisions at the right point in the sales cycle. Listrak's mobile marketing solutions enhance customer value by providing engaging messages that are equally effective on desktop, tablet or smartphone. This, in turn, boosts engagement, conversions and your bottom line. All of this can be done from our single, integrated digital marketing platform. Your customers interact online. Retailers know they have to be part of the conversation in communities like Facebook, Twitter and Pinterest, but have struggled to figure out how those social interactions impact revenue, because social networks have not been a strong sales channel. However, when combined with email - the undisputed highest performing marketing channel - social campaigns not only increase engagement and reach, but revenue as well. Listrak's single, integrated digital marketing platform includes a number of tested, strategic social applications. True customer engagement and loyalty come from presenting a consistent brand message and shopping experience across multiple channels. Listrak's merchandising cloud gathers shopper data online in real-time, including preferences and purchase history, that you can use to inform future campaigns, increasing the effectiveness of your cross-channel marketing. With Listrak's single, integrated digital marketing platform, you can create truly personal, one-to-one marketing campaigns at every customer touchpoint that have an immediate impact on engagement, revenue and ROI. Your customers don't just shop in one channel, and now your data doesn't have to exist in one, either. Listrak's single, integrated digital marketing platform is powered by our exclusive merchandising cloud. This allows you to collect customer data and insights at every touchpoint. You can use the data in your omnichannel campaigns to create the most personal and consistent shopping experiences, increasing engagement, revenue and loyalty. 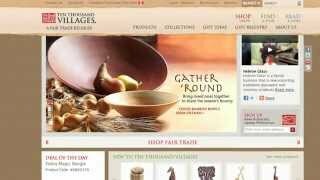 Chris Fenwick, eCommerce Manager for Ten Thousand Villages who uses the Magento platform, discusses her partnership with Listrak.